Paul wasn’t a typical child from Angola. He was quiet as well as shy, but he was always laughing. He had green eyes and black hair. He was very tall for his age. He was living in a poor neighborhood called Lixeira (Portuguese for “dustbin”). It was a normal day when Paul arrived at school. Deep in his heart, he felt that something was about to happen, but he didn’t know what. When he enteredhis classroom, he saw that his peers were excited about something. So he asked his teacher: “Why is everyone so excited?” The teacher answered: “We have a new friend named Kamba Dyami and it is a computer.” Paul asked: “Kamba Dyami?” “Which means MY FRIEND in one of the African languages used in Angola. The language is called Kinbundu”,said the teacher. Paul sat in his place a little bit confused, though he liked the idea of having this new friend as he’d never had a computer in his hands before. After ten minutes, the teacher entered with the “new friend” and gave one to each student. The teacher also got a new friend, but he didn’t know how it worked either. Two of Paul´s friends, who were living near his house, asked him about this computer, but Paul couldn´t explain what it was because it was the first time he held one. The class was very noisy when a stranger entered. At the moment when he entered everyone made silence. This strange man came to explain all about Kamba Dyami. Also, he came with a challenge for the class. Everyone had to make a video about their neighborhood using this new technology. After one week, he was to choose one to receive a prize. Paul, who was born in Lixeira, had never asked himself these questions. On the other hand, he thought this was a real challenge. He was concerned thinking that he wouldn’t be able to complete the project because of the problems he had with his parents and siblings. They didn´t pay attention to him because they thought work was more important than studying. However, it was now mandatory for children to attend school in the country. When Paul´s parents and siblings were children, studying wasn´t obligatory. But Paul learned to use Kamba Dyami faster than he thought. During the first and the second day, he wasn’t able to do any interviews because he had to work with his family. On the third day, his brothers took the computer and they didn’t want to give it back to him. 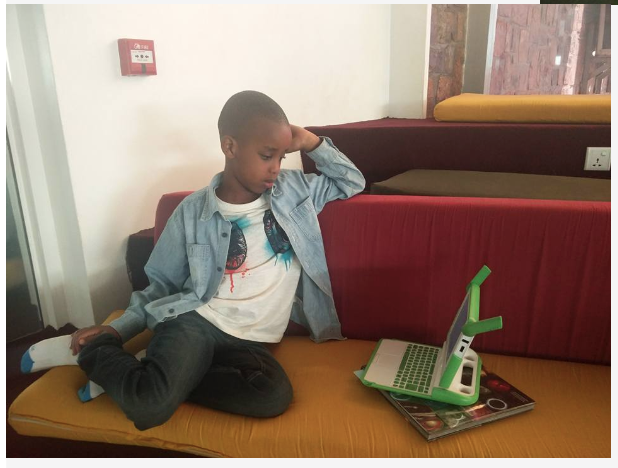 Paul already knew a lot about the Kamba Dyami laptop because he had already explored all the activities it had. However, he wasn’t able to do any interviews until the fourth day. The neighbors saw him walking around the neighborhood with the computer. They asked his parents what was going on, but Paul’s parents answered that what he was doing really didn´t matter. On the other hand, people saw Paul’s computer ability and they encouraged him to become a master of this technology and told him that nobody in the neighborhood could use a computer as well as him. On the last day, he was able to complete many interviews around the neighborhood and accomplished his task. This was a big challenge for Paul. 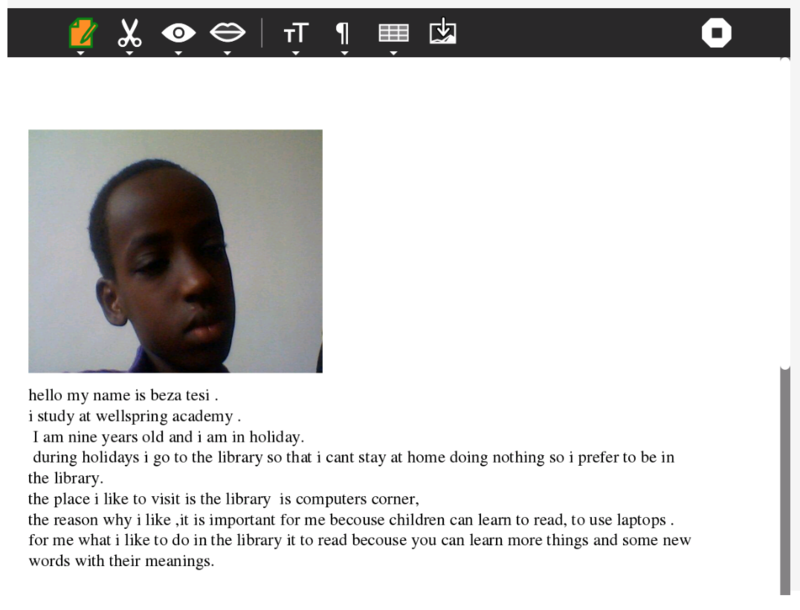 Through this activity, Paul not only learned to use the computer, he also learned a lot about life. He learned about the people who were living in his neighborhood. He acquired new skills and learned that he can change his own future through education. It is hot season in Rwanda, and international schools are on summer holidays. Governmental schools will soon be on summer break as well. Many parents are happy but also worried about what their kids will do at home all day. They do not want their children to forget what they have been learning during the school year. 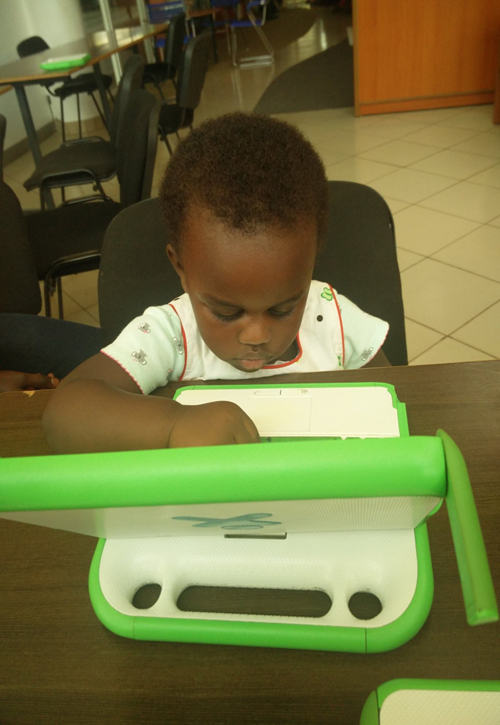 The OLPC corner, located in the kid zone at the in Kigali Public Library, hosts children from 8:30 AM to 5:00 PM. Every child is welcome and it is free of charge. Children have the opportunity to read, write stories, and play educational games, including typing Turtle, memorize, and maze. Children can also work with simple programming languages like scratch. All of those activities are available in XO Laptop. 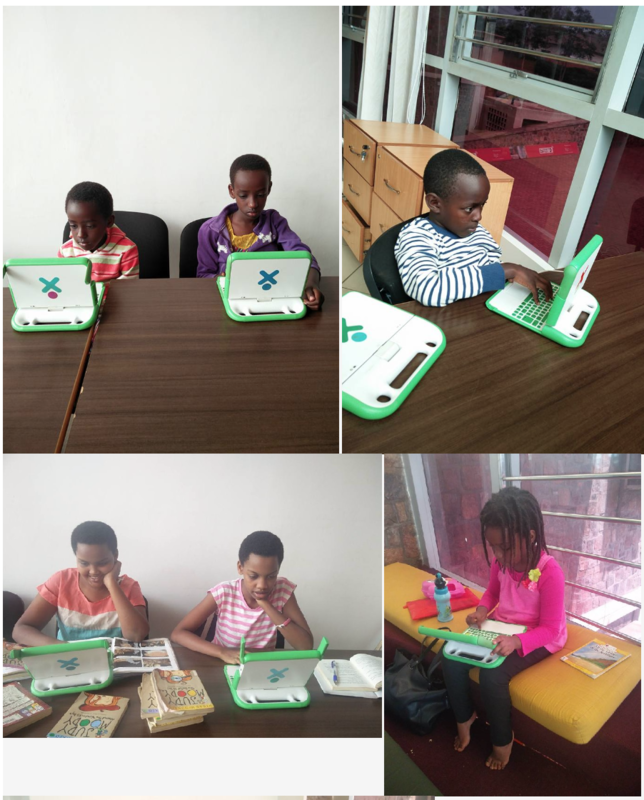 Instead of staying at home alone, children can come to the Kigali Library to take advantage of the computer. Any kid is welcome to come. 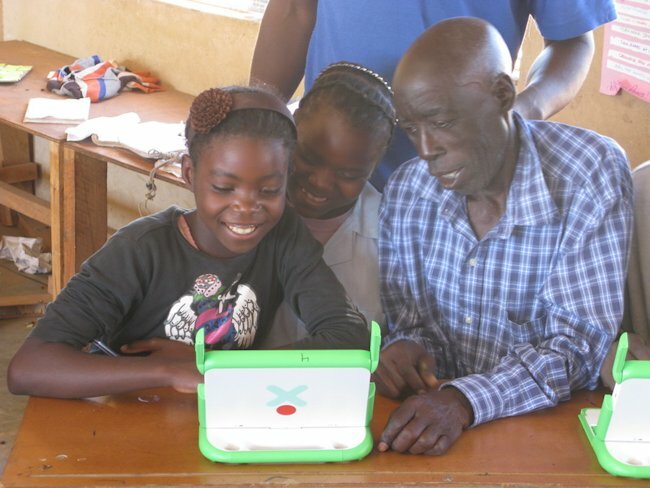 Thanks to the guidance of Celestine NGARAMBE, OLPC facilitator, they learn, they create, they share, and they explore. Kids are having fun through learning. We believe that holidays are not meant to be spent sleeping and watching movies; rather, holidays here mean to change the situation you’ve been living in to experience another opportunity. Award-winning US travel writer Candyce H. Stapen (gfvac.com) recently visited Wilderness Safaris’ Toka Leya Camp from 15-17 June, not only to enjoy Zambia’s renowned hospitality, but also to donate 11 new computers. 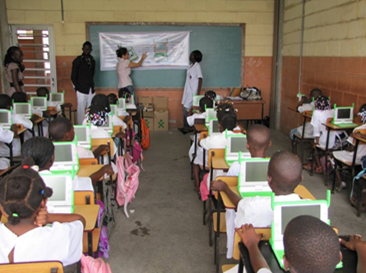 The laptops from One Laptop per Child (OLPC) are powered by their own individual solar panels, which eliminates the immediate need of providing electricity for the school. The computers’ programmes are also able to operate without Internet access when necessary, although Internet access is a plus. 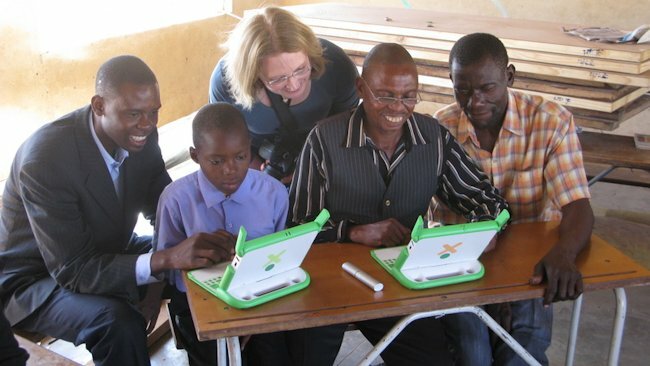 According to Dr. Sue Snyman, Programme Director for CITW, one of the main priority needs previously identified by the School PTA and village headmen was access to computers. Toka Leya’s GM, Petros Guwa, and Dr. Snyman work closely with the school in terms of community development projects and meet with the PTA on a regular basis. “The teachers are extremely enthusiastic and proactive and we will be working with them an ongoing basis to ensure the correct assistance and training is received. Ideally we are hoping to grow this project so that the school has the required number of laptops to ensure maximum benefits to both the children and teachers”, Snyman added. 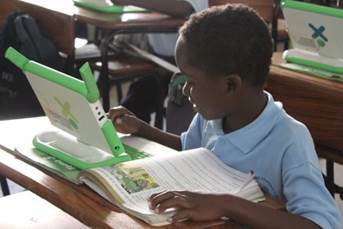 OLPC is a non-profit organization founded in 2005 with the goal of transforming education by providing every child with access to a connected laptop computer, the XO laptop. Connected laptops provide a cost-effective way to create learning environments that facilitate the greatest possible development of all children. 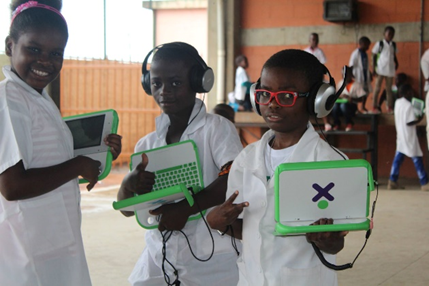 OLPC is driven by a firm belief that laptops have a unique ability to leverage children’s innate curiosity and desire to learn, to develop critical thinking skills, and to foster a lifelong love of learning. 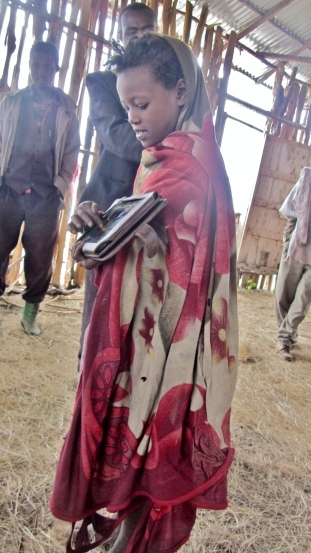 A laptop and solar panel, plus shipping fees, cost USD350. Donations of any amount are welcome. To assist us with achieving the next minimum directed order of 100 laptops, please contact Candyce (donate@hennyskids.com), Sue (sues@wilderness.co.za), or send a check or money order in U.S. dollars made out to One Laptop per Child for any amount. Please mail your donation to: Henny’s Kids, P.O.B. 42673, Washington, D.C. 20015-9998, USA. 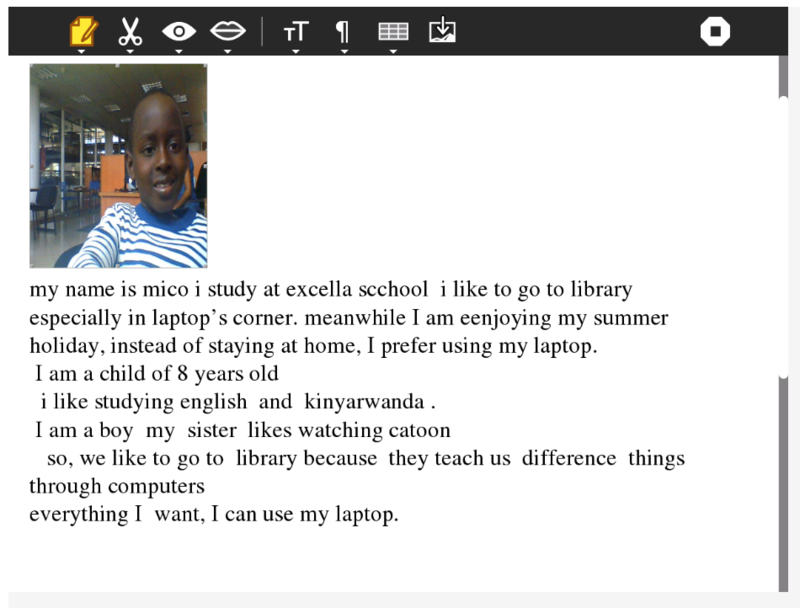 Two lovely updates from OLPC communities in Kenya this summer: the Ntugi group and Eshibinga group are both publishing their summer plans and class projects on their blogs.